Publisher: MacMillan & Company, 1879. Hard Cover, 420 pages, 6 x 9. This book is an important piece of brewing history. 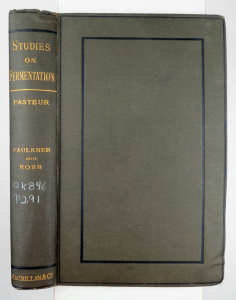 It is a first edition copy of the original English translation of Louis Pasteur's ground-breaking 1879 book, ETUDES SUR LA BIERE, or STUDIES ON FERMENTATION. This edition, as stated on its title page, is "A translation, made with the author's sanction, with notes, index and original illustrations, by Frank Faulkner, author of the ART OF BREWING, etc." This book single-handedly changed the course of brewing during the late 19th and early 20th centuries, representing a huge leap forward in the scientific understanding of the processes involved in beermaking. Brewers around the globe put Pasteur's findings to work in their breweries, and thus plunged the industry headlong into the modern era. But, of course, the brewing industry recognized almost immediately the impact that Pasteur's work would have on the art and science of beermaking. Frank Faulkner, the British brewing scholar who undertook this English translation with Pasteur's sanction, wrote, "Seeing the vast importance of Pasteur's work from a practical point of view, after writing a review of it for the Brewers' Journal, I determined to procure, at any rate for the use of my own pupils, a literal translation, illustrated by photo-lithographic copies of the original plates...It was on the completion of this translation that my views and desires expanded. The more I studied the work, the more I was convinced of its immense value to the brewer as affording him an intelligent knowledge of the processes and materials with which he deals...I determined accordingly to publish the work if I could secure the consent of its distinguished author...The debt which we English brewers owe to M. Pasteur can hardly be over-estimated." » Just want an inexpensive reading copy? Click Here.